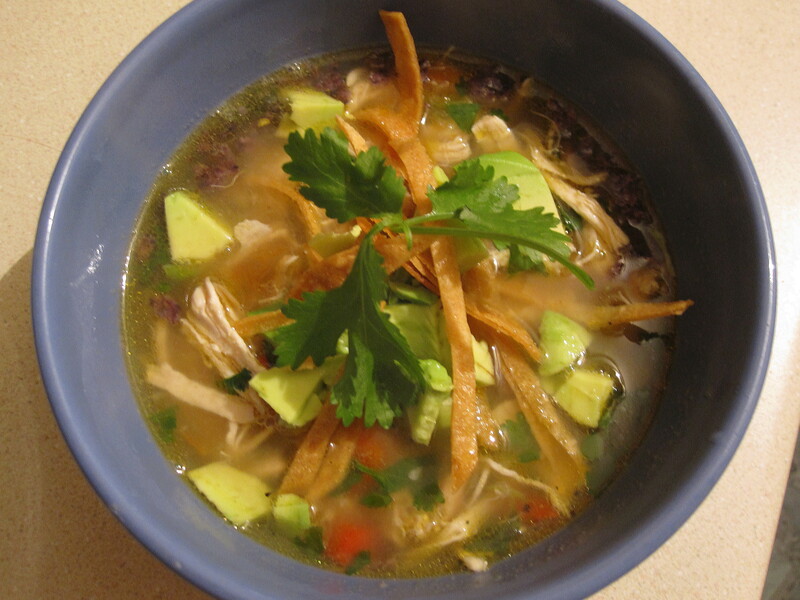 We sometimes get requests from our loyal readers for certain recipes and one we recently received was for chicken tortilla soup. This worked out perfectly because I happen to be a huge fan of tortilla soup and I have never made it before. So, I happily took on this challenge and made it on a very cold Sunday afternoon. I have a recipe for tortilla soup from Le Cordon Bleu from my sister’s culinary school days but it creates a soup that’s not exactly the style I wanted to make. It’s one in which you need to add hominy and puree tortillas and I felt overwhelmed and confused immediately upon reading it. 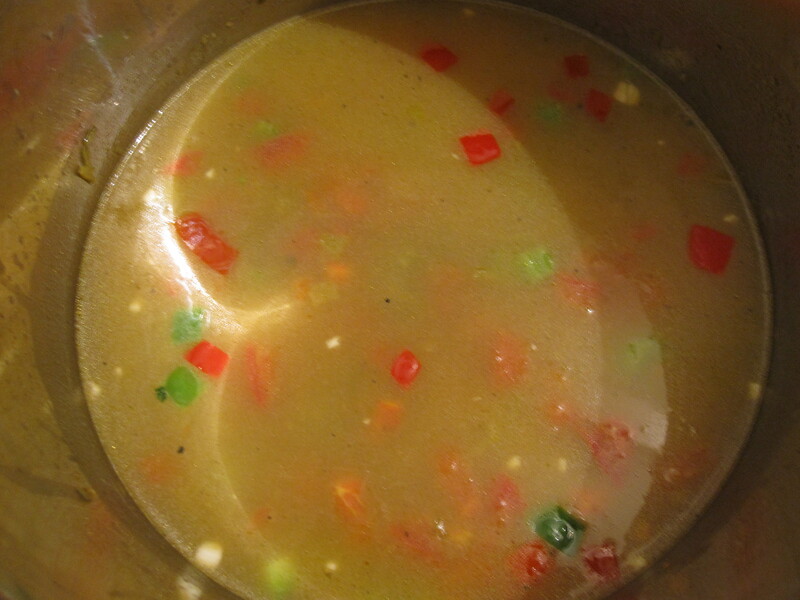 Though it may be more authentic, it’s just not my taste (or preferred texture for that matter) and so I set that one aside and looked for a more familiar broth based soup. I searched around a bit and thought about making it in the crock pot or making it with enchilada sauce as some recipes called for. None of these ideas really appealed to me though and in the end I finally stumbled upon this recipe from the Blue Corn Cafe and Brewery via foodnetwork.com and decided to give it a try. Why this recipe you may ask. Well, I loved how the recipe contained a separate recipe within it for making the chicken. I didn’t fully realize at the time, but can tell you now, that I think this made the difference between a good soup and an amazing soup. It certainly meant more prep work and more cooking time, but it was well worth it. Try not to skip this step (of course you can if time is an issue). 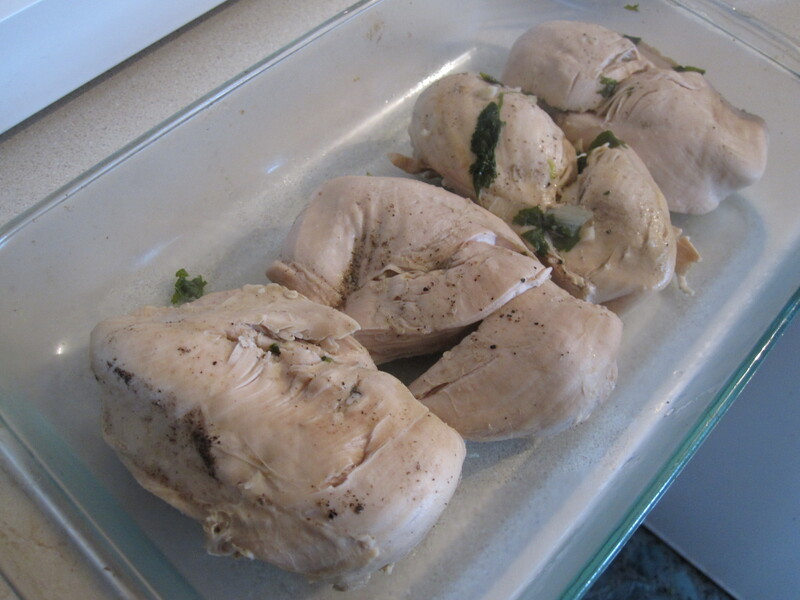 Like I said, the first step was to cook the chicken. 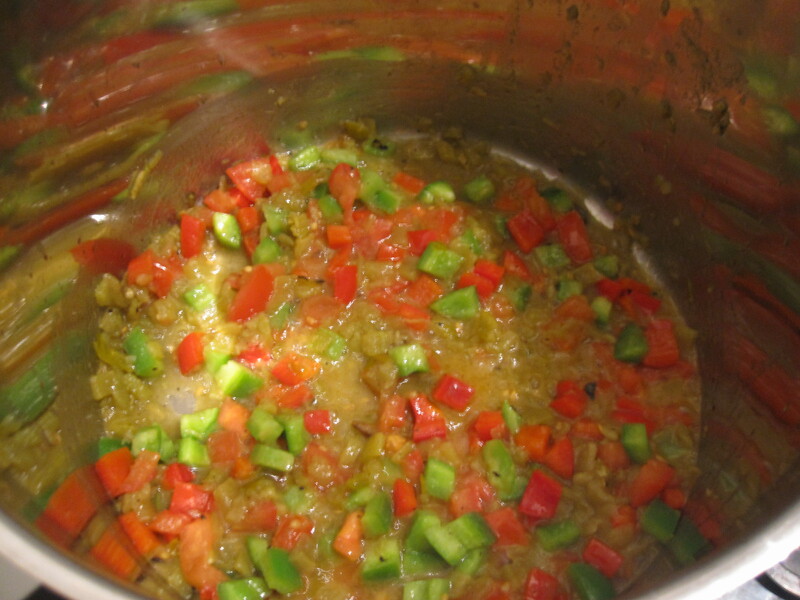 From the recipe: This “machaca” style cooked meat is very versatile: use in tacos, enchiladas, soup, nachos, burritos, etc. Basically a process of braising, the meat and all ingredients are put together in a large pot and brought slowly to a boil. 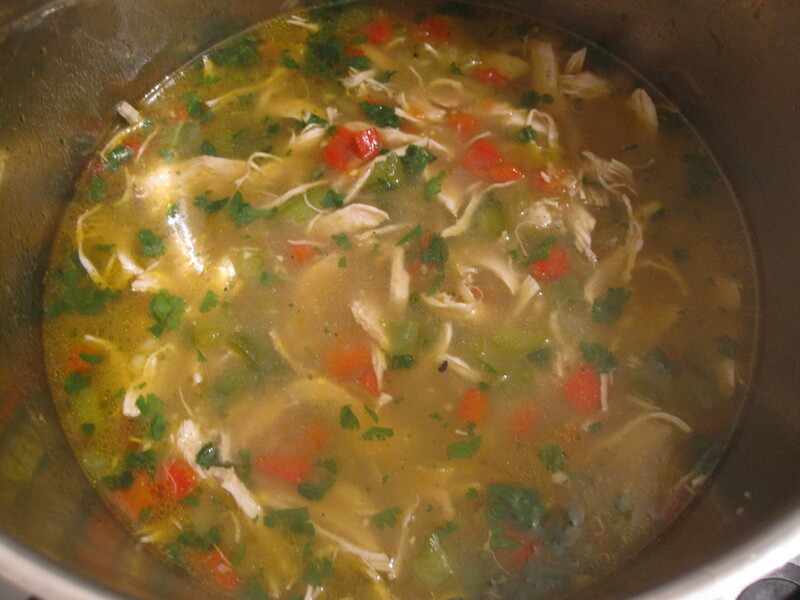 Not only did this flavor the chicken and make a big impact on the soup, but the leftover broth (which is not directly added to the tortilla soup) can be saved for other uses and is delicious. 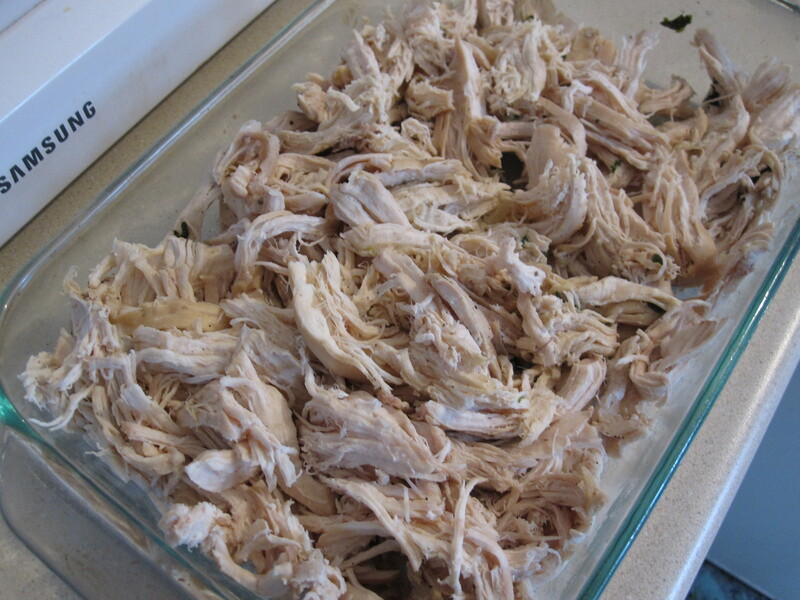 I also learned how important oregano is to Mexican food and I urge you to get fresh oregano for this recipe as well. You’ll taste the difference. 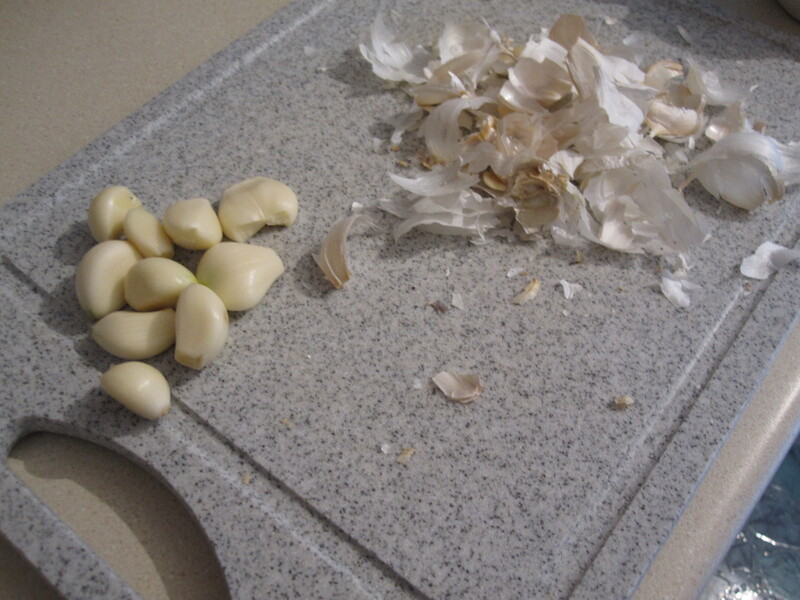 There’s also a lot of garlic in the braising liquid! Also along for the ride: onion, green pepper, cilantro, oregano, salt, pepper and water. and with two big forks, shred it up. Now, on to the soup itself. 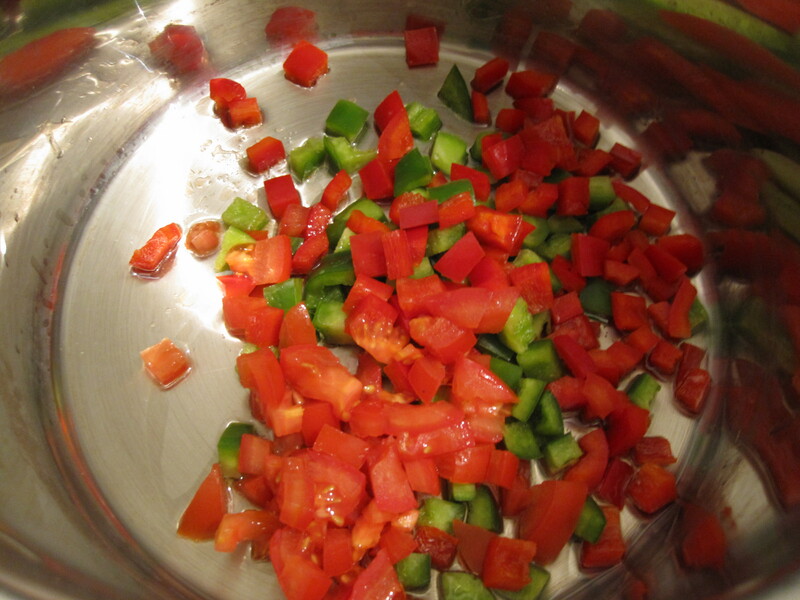 Saute some peppers and tomatoes. 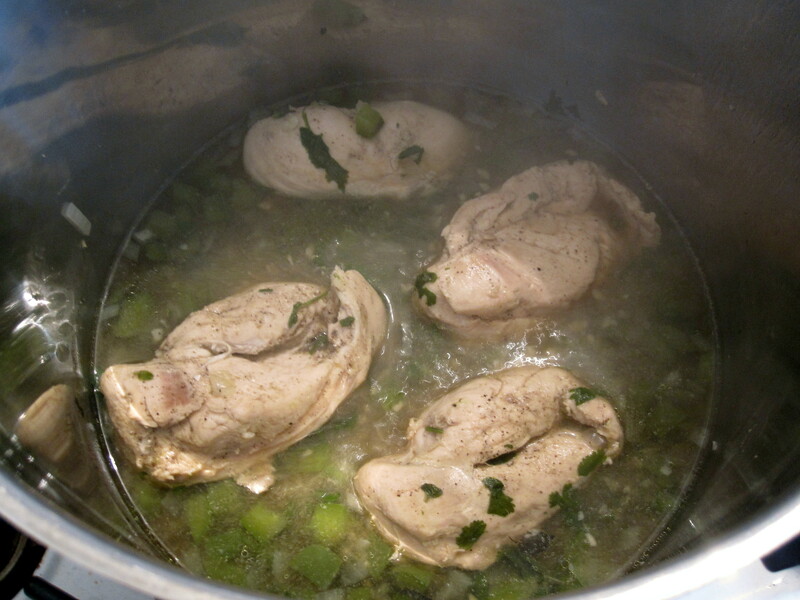 Add the chicken and simmer for 10-15 minutes. 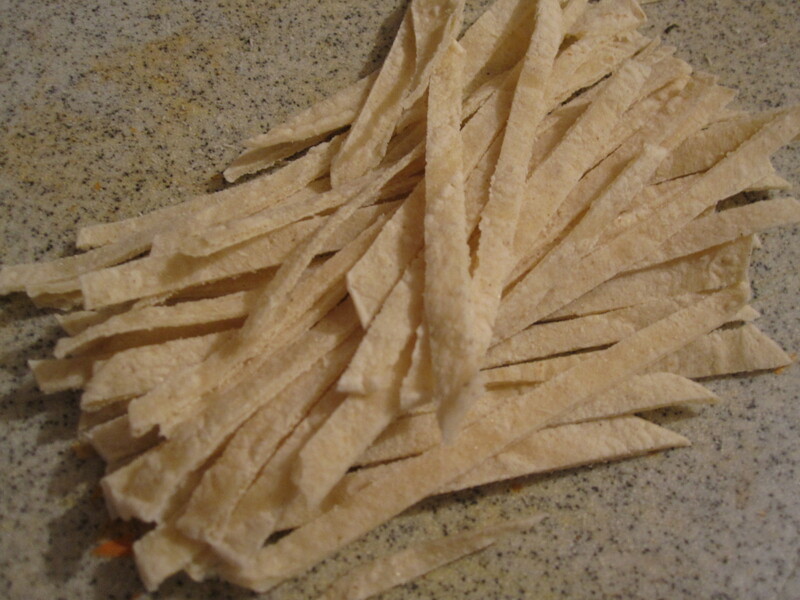 Meanwhile… I made the tortilla strips. 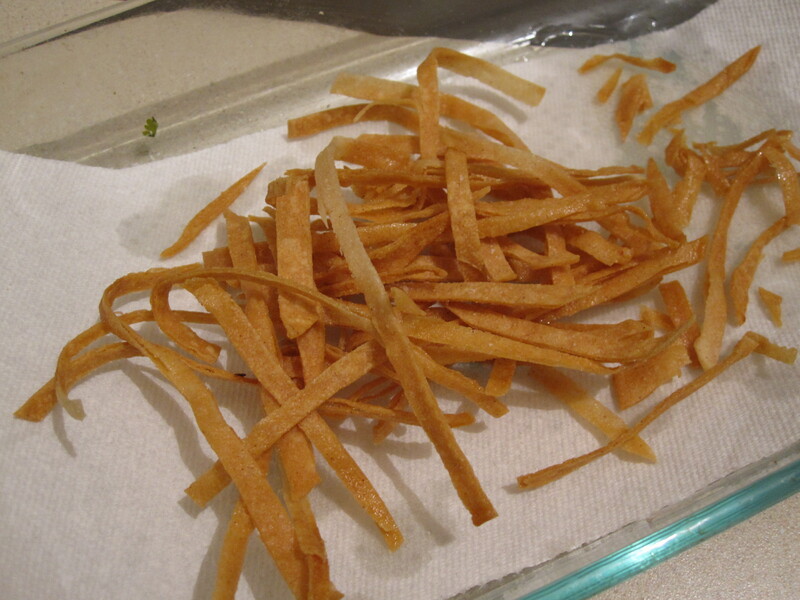 Tortilla soup just isn’t as good without these fried gems and they are super easy to make. 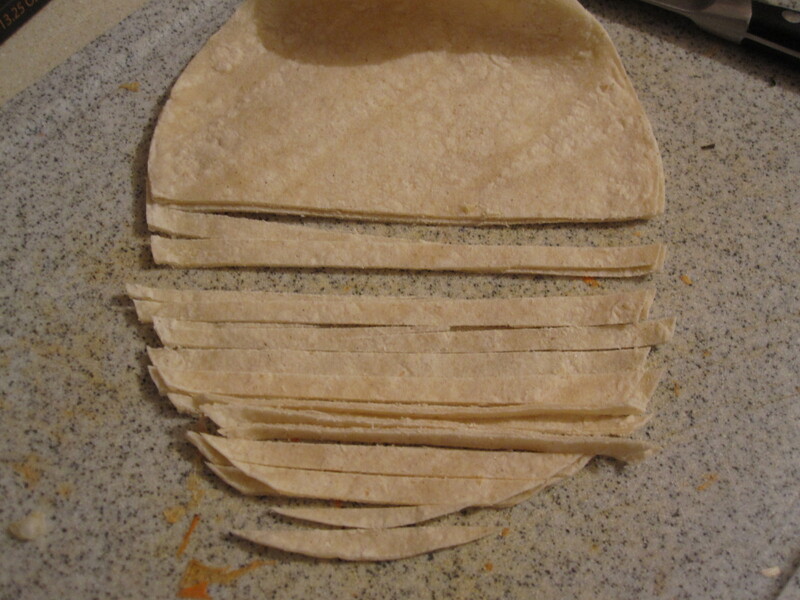 First cut the tortillas. I used a flat knife and it was very easy to get a nice straight edge on the strips. 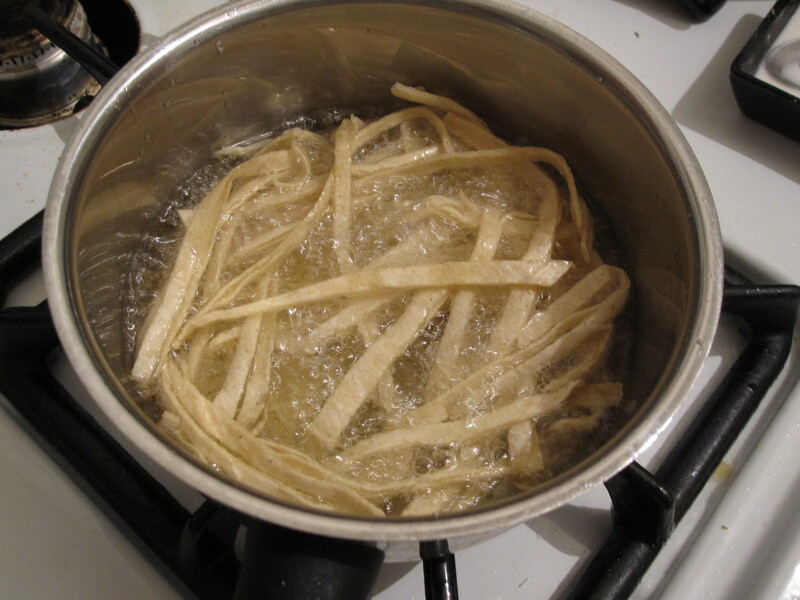 Heat vegetable oil in a small pot until it reaches 350 degrees. No thermometer? I didn’t have one either. I let it heat up for about 5 minutes or so and tested one of the strips. When I put it in it sizzled right up and I knew the oil was ready. Be careful here as the oil can get really bubbly. The strips will need about 2 minutes or so. Keep an eye on them ’cause they will cook quickly. Drain on a paper towel and salt them immediately after coming out. 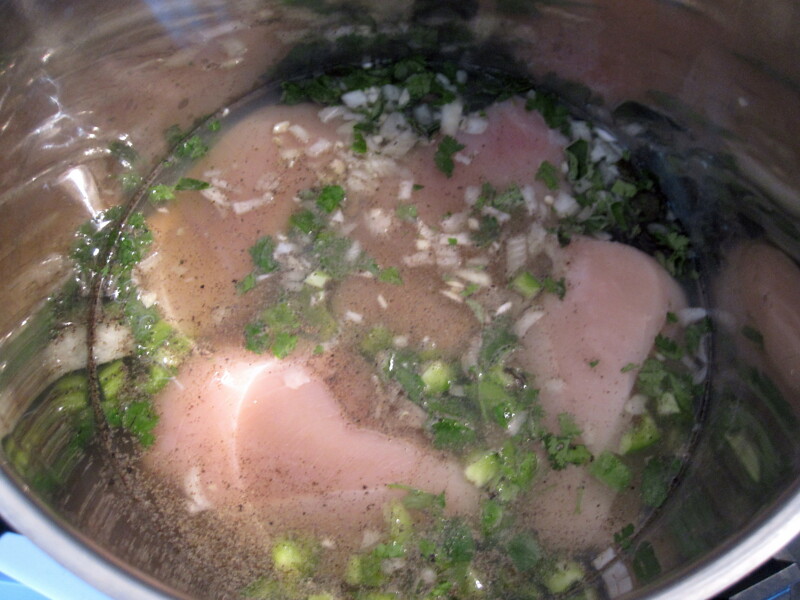 Finish the soup with some slurry, lime juice and cilantro. 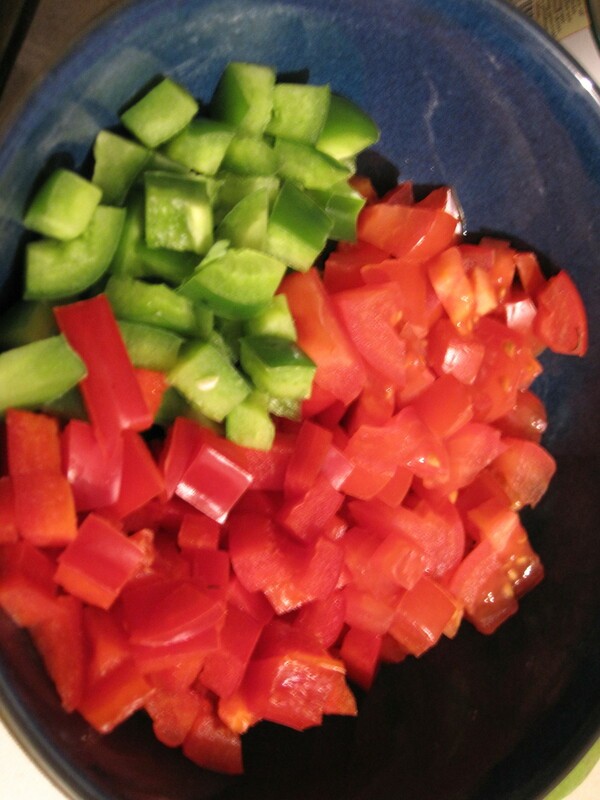 Add some crushed chips to the bottom of each bowl. 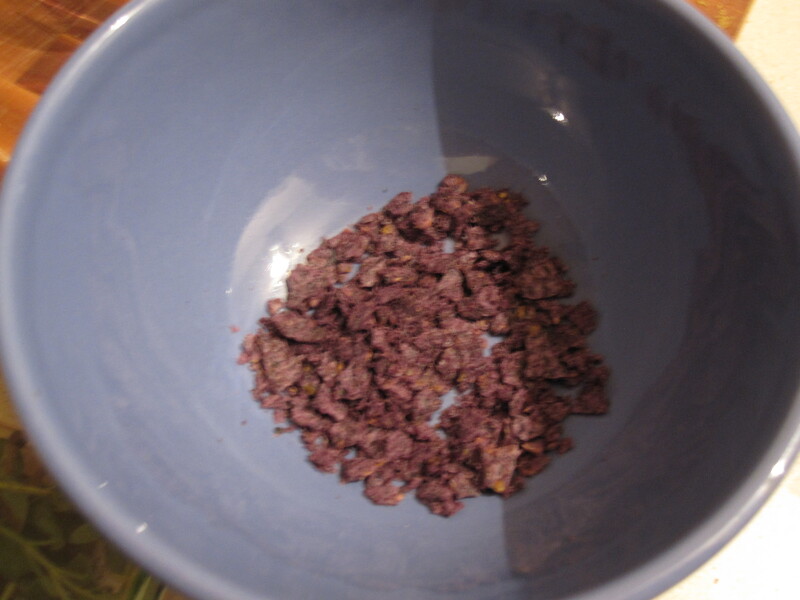 These are blue corn chips in my favorite blue soup bowl. 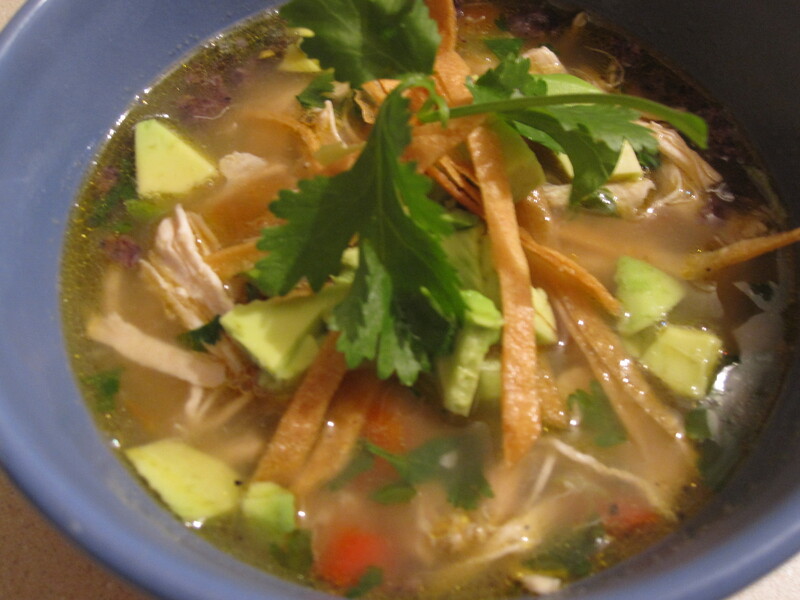 Pour the soup over the chips and garnish with tortilla strips, avocado, and cilantro. Wow was this soup good!! It was also super good reheated for lunch the next day. Hope you give this one a try! 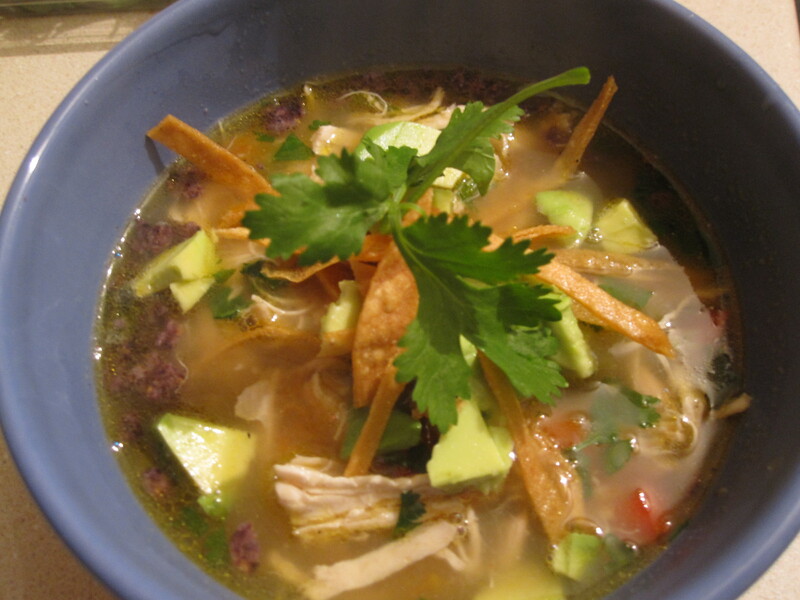 This entry was posted in Chicken, Soups and tagged avocado, chicken, chicken broth, chicken tortilla soup, corn tortilla, dinner ideas, enchilada chicken, garlic, green chilis, green pepper, homemade, how to make, low carb, low fat, Mexican, onion, oregano, recipe, red pepper, soup, tortilla strips. Bookmark the permalink. My boyfriend keeps asking for a tortilla soup and this looks awesome! I think he wants a creamy (super bad for you) one, but this is more my speed when it comes to soup 🙂 It looks delicious! there is a link to the recipe at the bottom of the page underneath “~E” in blue with the amounts and specific directions. enjoy!